Denton police force is short-handed with recent retirements and senior officers on training courses, so Detective Sergeant Frost is allocated the investigation of the death of a young girl whose body has been found by the railway tracks in a wood on the outskirts of Denton. Frost has an unhappy home life with an absent wife, and a complicated and secret relationship with DC Clarke. Sue Clarke wants commitment from Frost but realises that that is unlikely to happen. He is an unconventional officer whose non-conformity to police procedure irritates his boss, Superintendent Mullet, who is determined not to action Frost's long overdue promotion to Inspector. Detective Sergeant Walters, the first black officer in the area, is on assignment from East London under a Home Office initiative called "Ethnic Diversification". He is initially asked to shadow DC Simms to learn the area and come up to speed with current investigations, one of which is a spate of burglaries where pets are killed and another of robberies by a gang on bikes, but soon joins Jack Frost to assist in his investigation when a young boy is found brutally murdered, his sister goes missing and links are discovered to witchcraft. 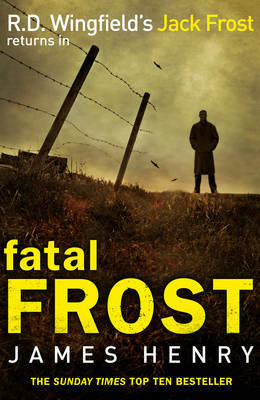 This is an early story about Frost, written by a long term fan of the original writer of the character, R D Wingfield. Set in a period when the Falklands War was at its height and on everyone's mind and unemployment and racial tension were rising - the sense of time, early 1980s, and place is very clearly drawn. I am a fan of both the books by Wingfield and the TV adaptations. My personal view is that this owes more to the popular TV series than the original books. The character of Frost will be easily recognisable to TV fans, but my memories of the books are of a more complex and humane Frost. Reading this was enjoyable though and I will certainly look out for subsequent stories, but I will also be re-visiting the original Frost series in the near future.